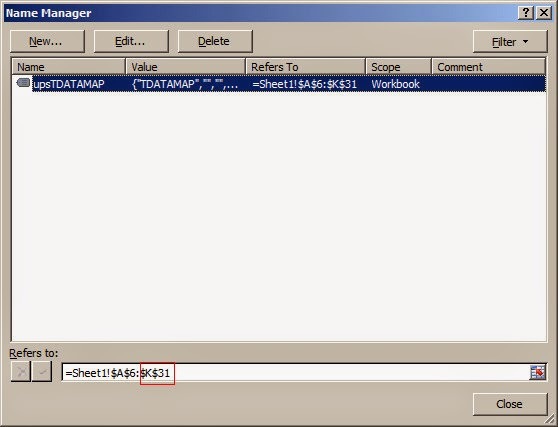 As i am new to FDM we need to update the mappings to include a script such that all customers in the field which do NOT start with a “C” are mapped to NO_CUSTOMER. 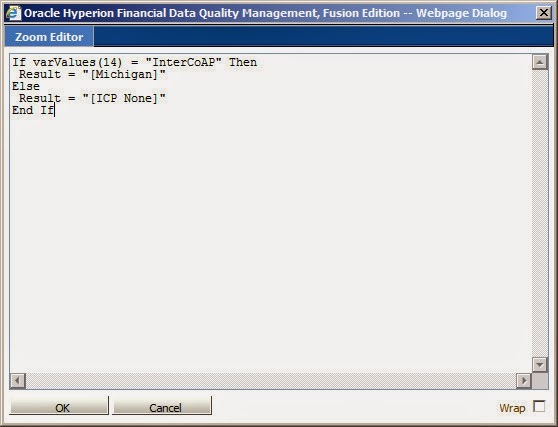 Hi Zeeshan, I assume you are using FDM Classic, because FDMEE will be another story. In you case, you may create a mapping rule with target as "#Script", in the Script filed, you can input - If Left(varValues(19), 1)<>"C" Then Result = "NO_CUSTOMER"
Hi Martin - Several of our entities did not fill in a local account description when the mapping was first established. We are wanting to update our existing mapping and have them include the description. However, when we update that field in the table and import it back in, the description is not added. They have also had this issue with updates to mapping. Do you know what might be causing this issue? Thank you for any guidance you can provide! I should note we are on FDM classic still. Hi, I think you can try to add the description manually first and then export to Excel. 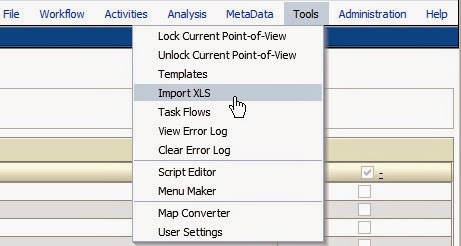 After that I think you will know the formatting about how to import the description via Excel. Hi Martin.. 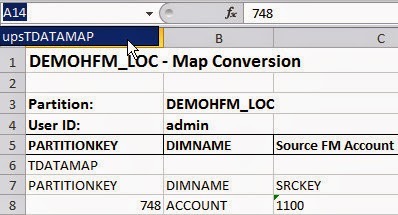 I am using FDM not FMDMEE.. and i have a parent location with two other locations using it.. What i am observing is if i update a member in the maps of one of the child location(not the parent) it is being inherited to the another child too. I do not want this to happen... Can it be done? Hi in my understanding of the parent location is, all the children will share the same mapping with the parent. When you change any of the children or the parent, it will affect the others as well. You can check whether the parent's mapping is changed as well. Hi Martin.. i have a parent x, y and z use x as the parent mapping, both y and z have two dimensions for mapping a and b, so what i want is a should be sourced from x and i want to maintain mapping of dimension b separately in y and z.
is that possible? i think i may be confusion you but i have nowhere else to go.. many thanks for your time. Hi, I think I understand your requirement a little bit. But because the parent location doesn't allow you maintain the mappings separately. How about you can think about to maintain the mapping of dimension b in x which is a full collection including y and z. But the condition is there is no overlap of the y and z mappings or you can think a "Smart" way to make it clear. In this way y and z can still share a mapping. Do I have to consider something special? Thanks a lot! 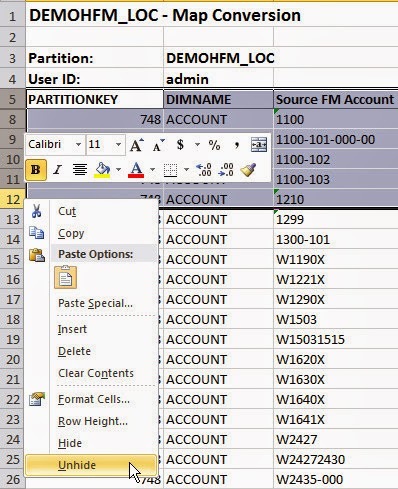 Hi, we are using FDMEE and I am trying to add a Multi Dimension mapping with one of our Accounts using Explicit mapping for AMORT.Data. However, it appears that FDMEE wants to change it to AM"OR"T.Data. Is there a way around the system recognizing the "OR" within the member name?